It’s that time again – time for family, friends, festivities, and traditions. What would Christmas be without Santa? And what would Santa be without another fun Montessori discussion? Well, it’s a topic that seems to need some re-visiting. As many of you might remember, a few years ago I addressed the burning question about whether or not parents should tell their children the truth about Santa. Maria Montessori thought that telling kids about Santa and letting them believe he really exists was wrong, and would lead to doubt later on when they found out the truth. I personally feel somewhat similar, and have not told my kids that Santa is real or that gifts come from Santa. I got lots of responses to that post, and they were mixed. Some people agreed with me, and others felt strongly that believing in Santa is a special part of childhood that adds to the magic of Christmas. 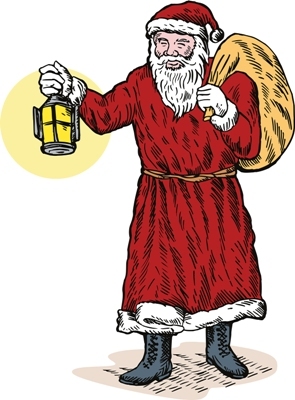 In that post (which I recommend reading if you haven’t), I do give lots of examples of real-life stories you can share with your children about St. Nicholas and how many Christmas traditions began. I wouldn’t have written on this topic again if I hadn’t received a comment from a hurting parent about this issue. I have to say that even though I am not personally a fan of leading children to believe in Santa, this parent is absolutely 100% correct. It is not the place of a teacher or school director to tell children the truth about Santa if they don’t already know. It took me some time – and having two little ones of my own – to begin to understand. Even before birth, the parent(s) set the tone for the home; they choose the clothes, the toys, the food, the books. They are speaking and singing to the child, telling them stories and creating fun times. But even more important, the parent truly is a model to the child of how to be human; the child learns about honesty, bravery, love, kindness, and all the other virtues by watching the parent. The lessons might sometimes be negative, but they are long-lasting and shape the child in profound ways. If a child’s personality and temperament is truly set by age 5, as scientists say, then by the time the kids entered my elementary classroom, most of the work was done. Sure, I could help them learn and grow, but whatever they learned from me would pale in comparison to how much they learned from their parents. Teachers can share their thoughts with parents about many things. Indeed, parents often welcome it and even come to teachers for advice. Schools can and should have parent education nights; most parents want to know more about a variety of topics from a Montessori perspective. No matter what the teachers share, though, the final decision about what happens in the home belongs to the parent. This is true whether the topic is discipline, nutrition, or family traditions. Not only is it not the teacher’s place to make decisions for the parents, but topics like these can be very personal for many parents, and they can sometimes find it hard to even listen to an opposing point of view. School staff needs to be sensitive. Parents also have a responsibility. When their children attend a Montessori school, they should read books and magazines about Montessori, attend parent education nights, and ask teachers whenever they have a question or something isn’t clear. But even as they do that, they need to make decisions for their own families that sometimes might conflict with what their child’s teachers believe. Parents who choose to celebrate Christmas with Santa must be ready for the fact that their child could find out the truth at anytime. Hopefully, it won’t be from a teacher, but there’s not much you can do if a classmate, neighbor, or even older sibling decides to spill the beans. That’s often how many kids find out, and it can be a painful experience. What you can do is be prepared; think about what you might say if your child comes running to you in tears, wondering if Santa is real or not. A little thought beforehand can help a great deal in times like those. Or, you might want to preemptively let your child know the truth about Santa once they reach a certain age, so that you can tell them sensitively before someone else does. Some final thoughts: believing in Santa doesn’t increase a child’s imagination – after all, they’re not imagining him; they believe he’s real. I can see how it might increase excitement, but it doesn’t increase imagination. Not believing in Santa doesn’t mean that a child can’t be imaginative. Santa and imagination actually aren’t related, even though many people entangle the two. I would also like to stress that Maria Montessori had absolutely nothing against imagination or children being imaginative. On the contrary, she understood that imagination (the ability to envision something not yet created) was one of the most powerful tools of the human mind. Maria Montessori and the Montessori method are not anti-imagination, and it is incorrect and misleading to say that they are. I welcome more thoughts about this topic, and as always, all viewpoints are welcome. No matter what we believe, we can usually learn something from each other.